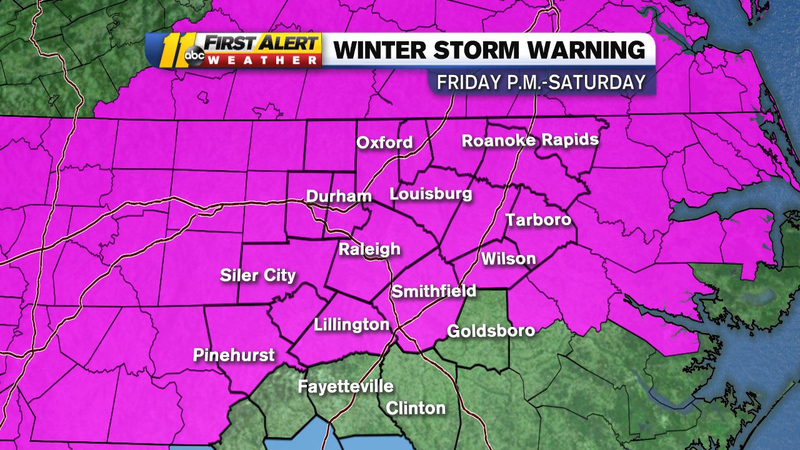 A winter storm warning goes into effect at 7 p.m. Friday until 7 p.m. Saturday. Here's what you can expect hour by hour into Saturday. Snowfall will intensify in Orange, northern Durham, Person and western Granville counties. Chatham and Moore counties will see all snow. Southern/eastern Durham, Wake, western Chatham and Lee counties will see a snow, sleet mix transitioning to all snow before sunrise. Eastern Granville, Vance, Franklin, Warren, Nash, Wilson, Edgecombe, Halifax and Northhampton counties will see a sleet, snow mix. The Sandhills will see a wintry mix of rain, sleet and a chance of snow after midnight. There could be some downed tree limbs and power outages caused by freezing rain. Sunrise -- All snow continues to fall in the Triangle. 2 p.m. -- Snow begins to end in Orange, northern Durham, Person and western Granville, Chatham, and Moore counties. 4 p.m. -- Snow begins to end in southern/eastern Durham, Wake, western Chatham and Lee counties. 5 p.m. -- Wintry mix begins to end in the Sandhills. 7 p.m. -- Snow begins to end in eastern Granville, Vance, Franklin, Warren, Nash, Wilson, Edgecombe, Halifax and Northhampton counties.